A recent survey found that more than half (52 percent) of parents without guns in the home have never discussed the topic with their children. Regardless of whether or not you have a gun in your home, experts say it is imperative that fathers talk with their kids about gun safety. 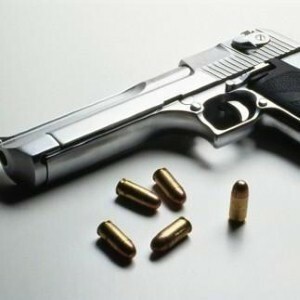 "With firearms in about one-third of the approximately 35 million U.S. households with children under 18, discussing gun safety is something all parents need to consider," said the University of Michigan Medical School's Dr Matthew Davis. "Parents in non-gun-owning households simply cannot assume that their children will never encounter a situation involving firearms." 3. Remove yourself from the area. Households with guns should follow basic gun safety to keep kids safe. This includes keeping guns in locked cabinets with keys inaccessible to kids, ensuring that they are not stored while loaded and keeping ammunition separate. While many kids want to pretend and play with toy guns, experts remind fathers to tell kids that real guns can injure or even kill someone. As always, it's important for any discussions with children to be age-appropriate.